Kate portrays a mediator in the series and has adequately prepared for the role by researching the occupation. Tracy takes on the challenge of playing an autistic character and appeared in subdued makeup, a stark contrast to Carat’s flamboyant character, who wears multi-colored wigs in the drama. 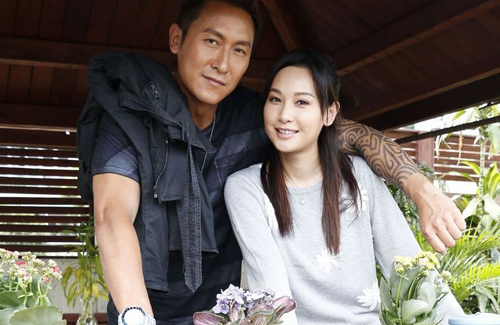 Although Kate’s character is married to Stefan Wong (黃長興), Carat comes between their relationship. Kate revealed, “Carat’s character is my nemesis and often upsets me.” Asked if she shared any acting tips with newcomers Carat and Tracy, Kate said, “There is no pressure working with them,” and added that Elena Kong ( 江美儀) is also an experienced actress on the set. Since filming started Harmony is a Virtue, Joe has little time for rest. Despite working with TVB for 21 years, Joe’s body is already protesting the demands of the hectic filming schedule. He said, “I slept only for three hours. After working like this for two to three days, my throat already started hurting.” However, he was full of praises towards Carat and Tracy, whom he said were quick learners and adapted to the filming environment easily. Joe is way too old for this type of role. I also don’t think he’s savvy enough to be a player. He somewhat portrayed one in Triumph in the Sky back in the days. Even then I didn’t think he’s fitted for the role. I don’t like Kate acting either but at least she toned down her fake eyelash in this pic lol regardless, I think this is a skip series for me. I think he also lacks that charismatic in his acting. He’s not a bad actor, he’s pretty good actually. Just the role doesn’t seem to fit him in my opinion. well, don’t let his looks fool you. I was shocked to read that he has “salty pig hands”. He might be salty in real life but he doesn’t bring the charisma onscreen. I agree Joe is too old for this role and is not charismatic enough to be a flamboyant guy although he does have a real life history with Rose Chan case. Ruco would be a better fit. Yes, Ruco would be perfect. Ruco, Bosco, Sammy, and Joel. 😀 🙁 LOL! pleeeese, not “slipper rice eater” Joel Chan. LOL! TVB needs all the help they can get. His acting isn’t bad. 😀 🙁 LOL! Yes please! I would like to see Ruco paired with Kate! Joe Ma is a very mediocre actor with mediocre looks. He has no charisma to be in lead roles. I still remember him for having zero chemistry with all his costars. agreed. think he’s too old though yeah. Agree with you. When i see his horsey face I want to zzzzzzz.